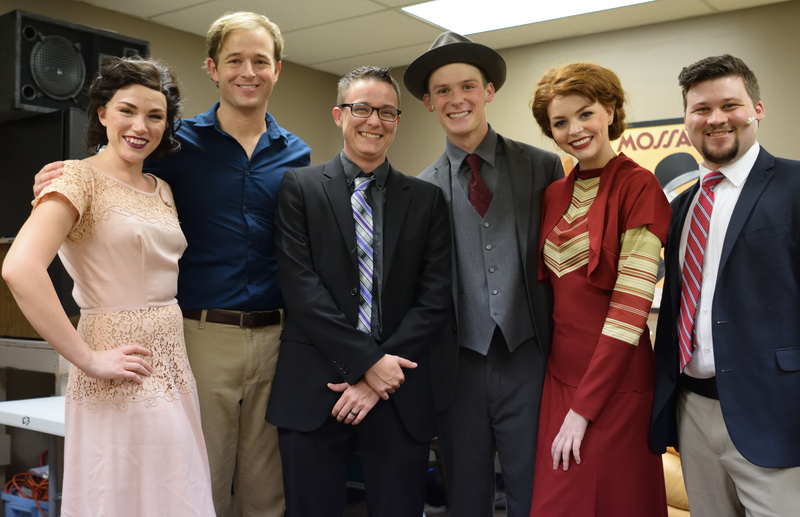 I recently had the privilege of attending the Denton Community Theatre’s production of Bonnie & Clyde. This amazing musical coincides with the 50th anniversary of the original premiere of the film at the Campus theater in Denton. One senior member of the audience was recalling his attendance at that world premiere, and he was not very kind regarding Warren Beatty’s portrayal of Clyde. However, he seemed to still have some affection for Faye Dunaway’s part in the original film. With that said, he seemed hopeful that the current performance would meet with his approval. The Campus Theater located at 214 Hickory in Denton, was filled to capacity and buzzing with excitement. Fans of all ages (Including the previously mentioned Dunaway fan) were ready to see the DCT’s interpretation of this outlaw love story. The opening scene introduces the audience to exceptionally capable young performers Lukas Jimenez-Bolin (Young Clyde) and Isabella Rose (Young Bonnie). From the first note to the last, these two performers pulled the audience into their respective worlds. Under the direction of Daniel Bryant-Gawne, the cast and crew provided a well paced and multilayered story of these famous outlaws. 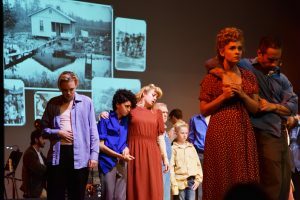 Not only did the scenes meld together artistically, but the musical score provided the pulse that pushed each act to a level of professionalism seldom witnessed in community theater productions. 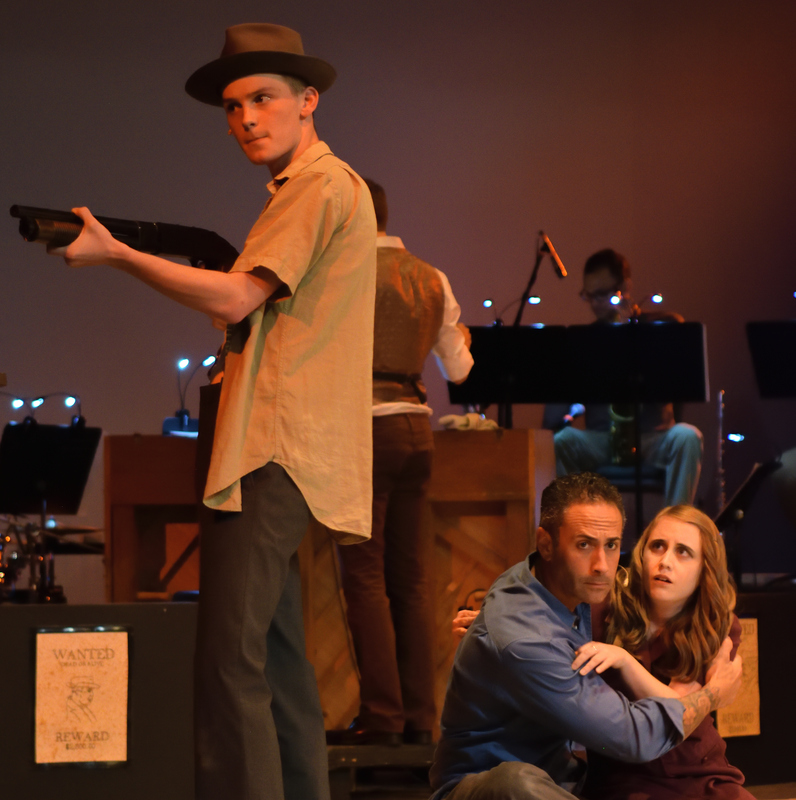 The story moves quickly to the adult versions of Bonnie & Clyde, portrayed by Anna Peña and Alex Peters. It didn’t take long for these two disparate country outlaws to find a place in the hearts and minds of audience members. In addition to the two leads, Blanche and Buck Barrow provided significant depth to this theatrical production. Blanche (Delace McMahan) provided some much needed sharp comedic wit and Buck (Chance Gibbs), rose to the occasion in his role of Clyde’s brother. Although this cast was peppered with amazing talents, I believe special mention of Anna Peña and Delace McMahan is warranted. Their vocal prowess was notable throughout the performance. However, when the two voices collided harmonically, it created a vibrant and visceral experience that will not be soon forgotten. Overall, this production exceeded all expectations. Character development, direction, sets(Pete Kelly) and orchestration(Frank Wildhorn) were great examples of how good local theater can be. Productions like this should help to insure Denton Community Theater’s place in the artistic landscape of our town for years to come. For those of you that have not yet seen a play in this venue, don’t wait. For more information on future productions, tickets and season passes, click on the following link DCT. 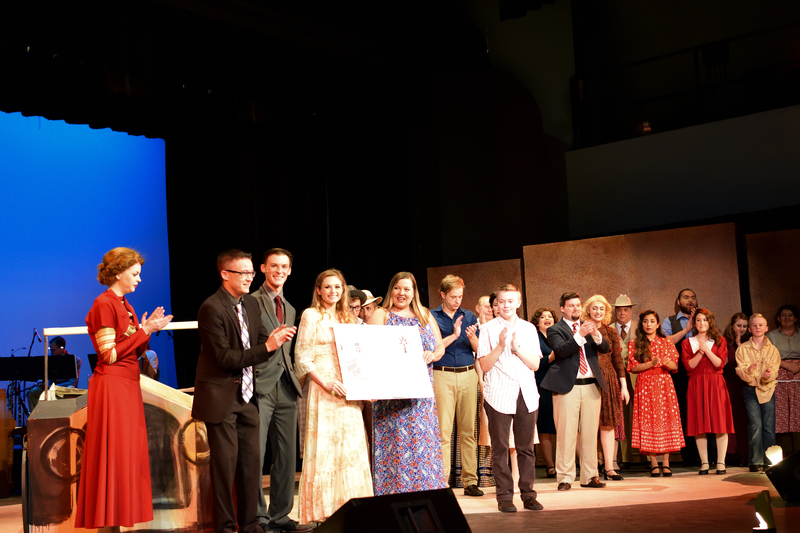 A special thank you to Mea Littleton for providing us with the complimentary ticket and access to cast and crew of this production. Additional pictures and comments can be found in Denton Dallas and Beyond Facebook group. Thanks Pete. I have made that correction. I’m a little confused. You’ve correctly attributed “orchestration” (the practice of writing music for an orchestra) to the original composer of the musical… but you’ve included that as an example of “how good LOCAL theater can be.” Something doesn’t add up. Did you mean to give a shout out to the “music director” (the person who directed the orchestra and ensemble for this LOCAL production of this musical)? If so, that would be Benjamin Brown. If not, then I apologize. Regardless, thank you for the review! I’m glad you enjoyed the review. Yes, the word orchestration created quite a dust up. Benjamin did a great job too.